A Bookmark, business cards, stickers and markers – these are among the many tools you can use for self-promotion, says self-published author Mike Bodnar. As a promotional tool for a self-published author, a bookmark almost goes without saying, but there are so many options that it’s worth looking at in some detail. Firstly, you can design your own bookmark and have them printed online and at very little cost. There are many web-based printers who offer templates which you can then manipulate to your own satisfaction. You can choose from one-sided or double-sided, colour or black and white, but don’t skimp; I recommend going for a colour and double-sided bookmark. The colour option allows you to include an image of your book cover – always a good selling point – while using both sides doubles the potential for your sales pitch. So, what to put on the bookmark? At the very least you need a concise and catchy synopsis of your book, an image of it, and a link to your book’s website, either a url, a QRC or both. But don’t ignore the option of using review quotes and endorsements. When I printed my first bookmarks I hadn’t received any reviews, so instead I concentrated on describing the book (travel genre) and highlighting the positives (funny, entertaining, dramatic). But by the time I was ready for a reprint I had received many favourable reviews, and so ‘A tour de force of waterways travel writing’ now features on the bookmarks, along with a few other endorsements. Particularly useful to those who read them are comments which liken your book to a more famous and established author, as it helps place where your book ‘sits’ in people’s minds. Hence, my latest bookmark includes a reference to Bill Bryson (though I can hardly claim to be his equal!). Then there is the issue of how you use your bookmarks. There’s no point in getting 400 printed just to have 350 of them sitting unused on your desktop three months later. So, seek leveraging opportunities and distribute them strategically. For example, as a waterways-themed travel book I make a point of leaving my bookmarks at chandlers, marinas, boat festivals and suchlike – where I can reach my target audience directly. I hand them out to passing boaties on the canal. I also undertake what I call promotional subversion, where I insert the bookmarks in library books of similar style and genre. If you take a Bill Bryson, Paul Theroux or Tony Hawk book out of our local library you will likely find one of my bookmarks in them! 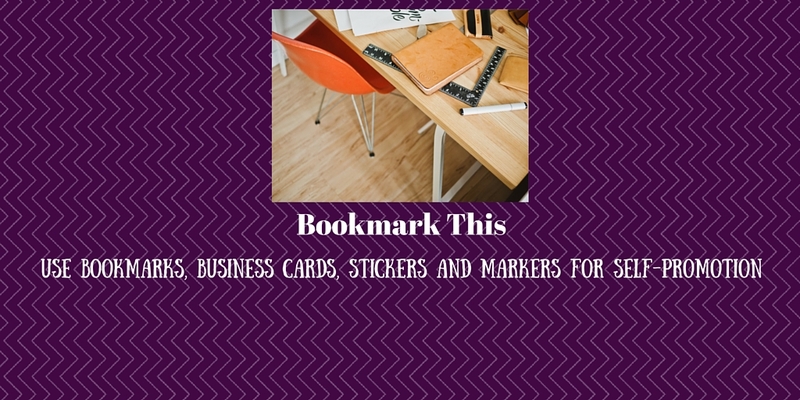 And of course you can hand your bookmarks out as business cards, at any and every appropriate occasion. As a self-publisher you will likely find yourself in an independent bookshop at some stage, trying to get them to stock your book. If so, you need a business card to leave with them (along with, hopefully, some copies of your book! ); it’s professional and the proprietor will expect it of you, as will any agent you manage to pin down. The same promotional opportunities apply to business cards as they do to bookmarks, except you have less space. Plus, it is more appropriate to include your own personal contact details on a business card, but certainly if you have an endorsement, use it! Again, there is a queue of online printing companies just waiting to help you with your business card design and printing. Go search them! I came up with the idea of a sticker for the cover of my book when I was taking a load of the books to New Zealand to promote them there, but realised that the blurb on the cover and the reverse didn’t actually mention that New Zealand featured largely in the story. That was for a very specific purpose, and it worked well. But also consider making a sticker quoting a great review you’ve had. I am soon to get one made that says, ‘A tour de force of waterways travel writing’ (one if my favourite reviews) and will arrange for it to go on all my books from here on. Again using online options, this is quick, cheap and effective, plus it’s a heck of a lot less costly than having the cover of your book redesigned to include the quote! Another good use of stickers is if you happen to find yourself in the glorious position of having won a literary award. Again, instead of a reprint, you can get stickers made for all your remaining books saying, ‘Winner of the Man Booker Prize’ (though if you get to that stage you’ll have a professional agent and publisher to do all the promotion for you!). Finally, the humble marker. The sort I’m talking about are those you can buy at stationers, designed for you to write ‘For Sale’ on your car windscreen when you leave it strategically parked somewhere. The tip is big and thick, and they are resistant to rain. I have just used one to write my book’s website url on the side windows of my boat, so that any time the boat is moored in a marina, alongside a quay, or burbling past walkers on the towpath, it is promoting my book. When it stops raining I am going to do the same on the rear window of my car. Knowing how long I spend waiting at traffic lights or stuck in crawling traffic on the motorway, I figure the cars behind me will have plenty of time to read it! There are plenty more promotional gimmicks, but these few are all easy, quick and cost-effective as promotional tools for a self-published author. Get to it!